SMi’s global portfolio of events on Pre-Filled Syringes secured an audience of over 300 senior drug delivery and medical device experts over the last year. 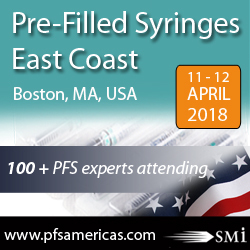 Next week, April 11 – 12, in Boston will be held 5th annual Pre-Filled Syringes East Coast conference and exhibition where all pharmaceutical, biotech and device manufactures meet to get updates on medical devices advances, parenteral drug delivery, share experiences and developments, and to network. Organisers encourage everyone involved in the PFS industry not to miss out on this premier platform as only limited number of delegate places remain available. For those interested in attending, contact Fateja Begum on +44 (0)20 7827 6184 or book on the Pre-Filled Syringes East Coast conference website. Event in brief: Over 17 presentations from a mix of leading industry players and big pharma such as – Novartis, Janssen, Nemera, MedImmune, Pfizer, Sanofi Pharmaceuticals, Schreiner MediPharm, Shire, Terumo, Tesaro, Teva, Takeda, Shire US Inc, GSK and many others.